December 18, 2011 - It is sometime in the late 1700’s, the seas are raging wildly and the booty is heavy. “Cut the lines you scalawag, cut the lines!” Timidly, the young pirate grabs his knife, puts it in his mouth and begins the long ascent up the swaying mast. Trying to focus on hanging on, trying not to imagine cutting him self - or worse, dropping the knife - these thoughts loomed over him heavier than the thick fog and life threatening waves surrounding him. If he dropped the knife he would be walking the plank, or worse, lose his share of the booty. Resourcefully, and for the sake of the booty, he grabs a nautical rope, cuts it to a manageable width and length, ties a crown knot, and fastens his knife; securing it around his neck. Voila! The first lanyard is made and no one walks the plank today! No official written pirate scrolls have been found to support the “exact circumstances that the lanyard was first used” or what term was assigned. But the lanyard originated out of a simple need for a simple solution. On ships and on land, lanyards were also used as a rope to fire cannons. Our research shows the original etymology of the word “lanyard”, also spelled “laniard”, dates back to the 1400's. It comes from a the word “laniere” which is French, and means a thong, or strap. So next time you see a girl in a thong bikini, you can say "Nice lanyard!". At any rate, French mariners used the “laniere” to pull or tighten the ropes and riggings on their vessel. Later, similar straps also found utility as a way to hold weapons, knives, pistols, and whistles. What is a lanyard? Is it Cantonese profanity (lan) for a poorly groomed (yard)? According to Merriam-Webster online dictionary, a lanyard is: 1. A piece of rope or line for fastening something in a ship; especially: one of the pieces passing through deadeyes to extend shrouds or stays. 2a. A cord or strap to hold something (as a knife or a whistle) and usually worn around the neck. 2b. A cord worn as a symbol of a military citation. 3. A strong line used to activate a system (as in firing cannon). Captain I’ve lost my pistol! So, aside from being a strap or thong used on ships, the original purpose of the lanyard was, in general, for keeping any item close at hand that is easily lost. Like ships and sailors, the lanyard also has its beginning roots in the military and other security sectors. Military men marched and travelled long distances, and so a strap attachment was needed to carry such things as a knives, swords, pistols, bugles, and whistles. During the era wars were fought by the Cavalry the lanyard proved life saving, as a dropped weapon surely meant death! In World War II British officers used lanyards to attach their pistols and whistles and in the American forces the lanyard is still used for that purpose. The Cuirassiers used a braid that connected their sword to their shoulder so that it was out of the way, but not out of sight, while the Austro-Hungarians authorized the lanyard as a badge of qualification, such as a marksman or gunner. Today the French use the lanyard as an award or to distinguishes a high ranking official. For example, Aides de Camp is distinguished as bagmen for high-ranking officials. History records that lanyards moved from the left shoulder to the right shoulder in 1920, due to the inherant struggle in quickly taking the weapon from the pocket underneath the bandolier. Sometimes delays in drawing a weapon meant death. However, the knife was removed in 1933 and the lanyard was used solely as an accessory to compliment an individual's garb. Napoleon Bonaparte is to the lanyard as Liberace is to the indulgent wardrobe. Regarding fabric and style, the lanyard probably started out as a simple rope, possibly made out of hemp or sails, used exclusively as a practical tool. As lanyards began to take on an ornamental role as well, the simple fabrics were replaced with white parachute chord and fashioned into single strands. The white single strand soon gave birth to the more detailed double braided cord. The double braided cord was worn around the shoulder and under the epaulette. As history marched on the fabrics, styles, and purpose of the lanyard evolved. During the Napoleonic era, Napoleon demonstrated his love for flair with majestic colors and elaborate braiding. The Cuirassiers followed suit with a fancy braid that connected their swords to their shoulders. In 1815, the Military Order of William of Orange utilized lanyards as awards. Today the Canadians and Americans are authorized to wear different colors of lanyards to distinguish their branch of service or rank as an official as well as for award recognition. We have seen the lanyard evolved from the sea, to land, to mountains, trees, buildings, and even the rodeo where cowboys use them to hang on for their life! Lineman lanyards are defined as a length of strong fabric looped through a metal “D” shaped ring that tightens around an attachment point. It is used both recreationally and occupationally as a safety measure to prevent falling injuries. There are three basic components to a lanyard system: The lanyard itself, which is the cord or strap. The adjuster, a knot or device used to alter the length of the lanyard. The terminations and connecting links are used to attach the lanyard system to the climbing harness. The simplest form of lanyard is the fixed length type. Designed for climbing poles, it is commonly made of leather with a buckle and used for length adjustment. These type of lanyards are made from the heaviest nylon strap, and industrial strength hooks or carabineers on the ends. Commonly called lineman's lanyards, variations are also used by mountain climbers and hikers. The simplest form of the lineman lanyard is the fixed length type. The adjustable “Prusik” lanyard is a three-strand climbing line equipped with two climbing snaps. One end is immovable and the other end moves freely on a loop. This type of lanyard also proves to be simple in both function and form. Today’s lineman lanyards incorporate reliable mechanical adjusters that are closer to the body when in use; this allows the climber to alter the length of the rope with only one hand. Wire core lanyards are reinforced with wire in the center; their rigidity makes them easier to scale up trunks, poles, and spars. Speaking of ornamental braids, in the 1950’s amidst a group of restless toddlers and creative mothers a new craft emerged, once again attributed to the French, and called scoubidou. The weaving knots used to lace together these straps, may have been copied by the French from the Chinese, 500 years previous. Named after a famous French singer, the new fad was dubbed “Scoubidou” while in America the fad caught on and was dubbed “Scooby Doo” after the famous cartoon dog in America (Scooby straps was the advertising name of the plastic cords they were promoting). Today it is often referred to as “boondoggle”. This ornamental braiding craft became a popular way to keep the children entertained cheaply and safely. Weaving together boondoggles required patience, knowledge of knots, finger dexterity, and creativity. If it was Napoleon that brought us colorful braided lanyards, it was the 2004 movie, Napoleon Dynamite, which brought back humorous memories of our generation embracing this beloved craft. One of the characters, Deb, goes door to door trying to peddle her creative master pieces in order to earn money for college. The diverse uses of boondoggle crafts today include: Jewelry crafts such as friendship bracelets worn around the wrist and necklaces that adorn the neck, key chains, animal shapes, gifts, and crafts at summer camps and kids clubs. Just as scoubidou is a form of art and self expression, the lanyards that are seen everywhere today can be expressions of our beliefs, humor, loyalties, preferences, and social and political views. Wearing a lanyard at work is like being a member of a team; only certain team members have access to certain sectors in their business; the lanyard raises esteem and pride for the company. 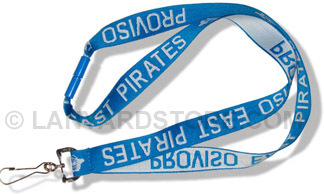 At school’s you might find the most creative of all lanyards of various sizes, colors, and attachment styles; many will be home made, but most are purchased on-line. They can function to hold cafeteria cards, student identification cards, mace, dormitory keys, cell phones, and car keys. From practical to ornamental, today the fad in America is promotional lanyards. This versatile item became a main stream hit in the medical industry first. The benefit for doctors and employees was that it clearly identified them at all times without the inconvenience of having to dig them out of their pockets. Contemporary lanyard materials include polyester, nylon, satin and silk and popular styles of lanyards include cord, tube, flat, or ribbon, and beaded. For example, a lanyard with flat tubing provides space for companies to advertise logos and promotional ideas free of charge. Custom printed lanyards are the latest fad, extremely inexpensive to purchase, and offer a rainbow of patterns, styles, colors, and lengths. Printing and graphic design techniques vary from a simple hot stamp to a more costly and complex dye sublimation process. Beaded lanyards can be used as ornamental advertisements or as a promotional give away that inexpensively advertises a service. These lanyards are used to help companies both advertise their business as well as serve a practical means to losing important items. Logos, colors, and various fabrics can be customized to best represent the company; as a result different types of attachments to the lanyard have also evolved. Badge clips are used by corporations and organizations to help identify employees and convention attendees for security purposes. Another form of a lanyard has a swivel hook, great for attaching badges that clip to a pocket or pants. A lanyard equipped with a ring attachment helps to tote around keys. Safety break away buckles are used as a precautionary measure that detach from the badge clip easily. This can prevent injury if the lanyard gets caught in a machine. The break away buckle, another option, can also hold mace that needs to be quickly detached and used for protection. A simple invention called the double attachment, allows users to utilize multiple badges or a combination of badges and keys. Retractable lanyards, called “leashes” are used by many mothers today with energetic and curious toddlers that have a tendency to wander away, and to offer a sense of security for the family visiting busy events and stores. In the twentieth century, the simple work badge has metamorphosed into a technology carrying tool with a cow hitch. It used to be that we only lost keys, identification cards, and kids. Now, lanyards will also hold cameras, MP3 players, cell phones, CD business cards, and USB flash drives that are capable of saving entire presentations. Modern earphones have successfully incorporated their audio signal into the lanyard while simultaneously acting as a hearing device. The Wii remote wrist strap is a modern form of the lanyard and is used for a simple purpose, as usual, to keep the device attached to the players arm. What are the uses for a lanyard? Today, lanyards can be seen everywhere; in medical facilities, air ports, government agencies, security services, large corporations, promotional events, schools, banks, conventions, occupations and recreations involving climbing, in art classes, in homes as crafts, and military and police departments. Voila! Now you know what a lanyard is; or should we say, you’ve always known what it is, but now you are familiar with the name, its many uses, and its history. (Or, if you already knew all this, congratulations, you just won the Final Jeopardy $65,000.00 pot!). The practicality and ingenuity of the lanyard has attached tools and riggings on the sea, decorated and armed military persons, and served as an art craft, later becoming a fad for kids from the 1950’s until now. Presently, it’s both an affordable promotional tool as well as an inexpensive and skillful fad. Multiple sources available upon request.